The geometry of the Locke Tavern is based on the square, but it is interesting to see how the circle that fits around the square was used. On the front facade, I have labeled the circles 'c' . The length of half the diagonal is the radius of the circle. The edge of the circle determines the space between the two squares, how the squares relate to each other. It is also where the front door is. The men who updated the house in the 1790's clearly recognized the original pattern: they worked with it, using the square's diagonal to determine the size of their additions. This is not design based on the 6 part geometry of the Daisy Wheel. 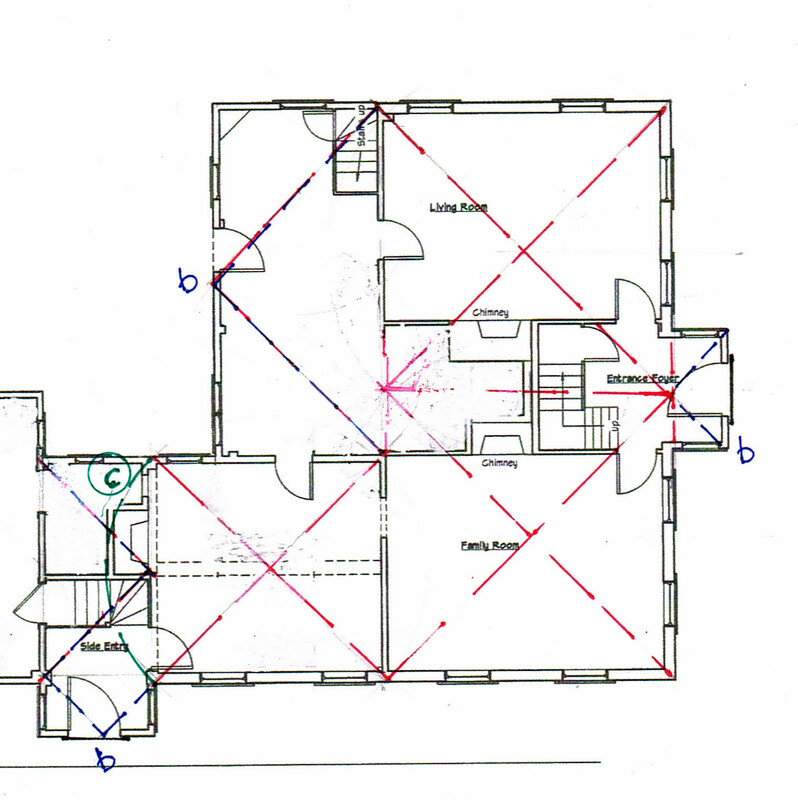 The layout may have begun with a circle, but its use seems subservient to the square. We know that house-wrights brought their knowledge with them from not just the 'old country' but specifically from their old neighborhood. And they passed their way of building on to their apprentices. Differences based on the origin of the colonists are visible in timber framing, barn and house layout. They are also visible in little things, like the shape of trunnels - the wood pegs that hold mortise and tendons together. Is this another regional variation? 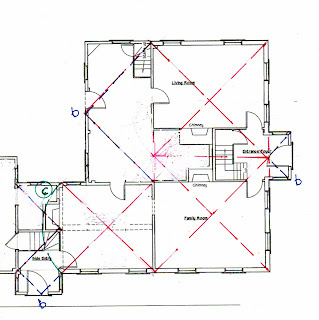 On the floor plan the arc of the square -marked 'c' - of the smaller room to the left includes the chimney stack. So, is that fireplace part of the 1740 house? The room needed heat. But in cold New England fireplaces were never built outside the frame, even in half houses, where the second part came later. Was there a little entry to the left, since enlarged? I doubt this room was part of an earlier house (that the front is a newer wing) as it lacks southern orientation. 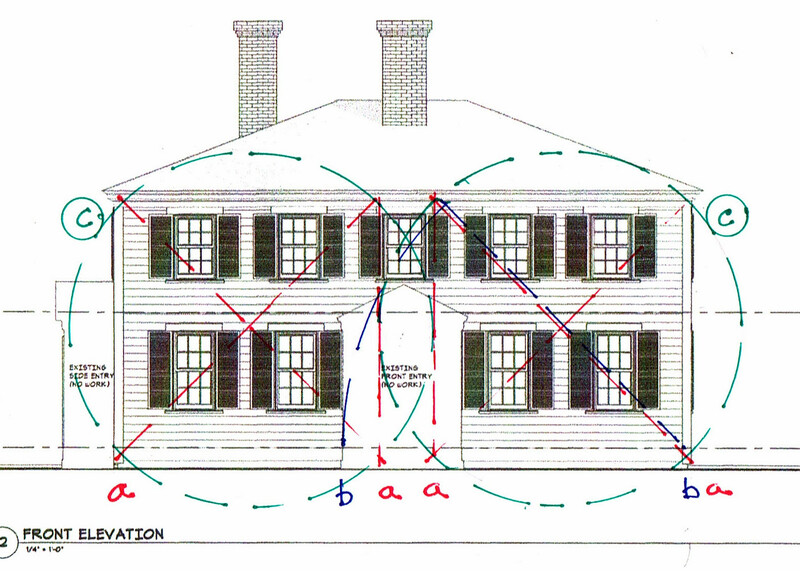 All this, of course, makes me wish I knew more about the construction of that part of the house and its foundation. Ah, the joy of being present when things are taken apart!